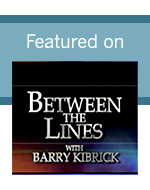 In the latest interview series of Between the Lines with Barry Kibrick, Barry interviews Robert Herbold, former Chief Operating Officer for Microsoft and Proctor & Gamble, and now managing director of the Herbold Group. Robert is also the author of What's Holding You Back: 10 Bold Steps that Define Gutsy Leaders, which reveals the challenges leaders face and provides 10 steps for improvement. In his interview, Robert shares why he believes courageous leadership, constant reinvention, and trust are necessary to achieve innovative excellence in the workplace.